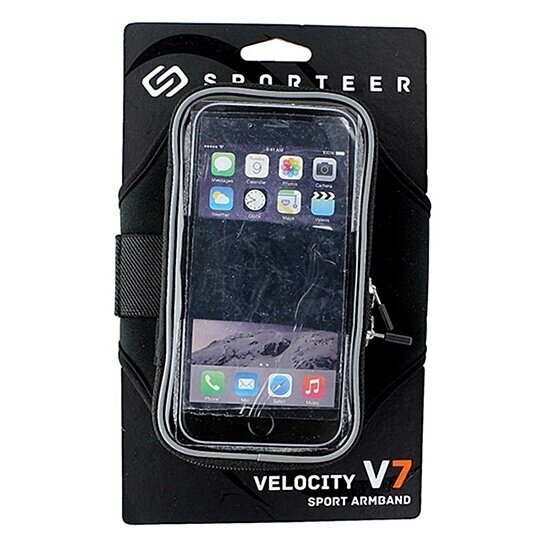 Sporteer products, The Velocity V7 Armband, Fits Apple iPhone 7 Plus, 6 Plus, and 6s Plus. Fits with most cases. Black and gray finish. Adjustable velcro strap. Medium/Large size. Secure zipper enclosure. Extra space inside for small necessities. External pocket for a key, credit card, ID or cash. Reflective piping and strap for night safety.